The study area is defined by the slopes and the floor of the Dysynni valley, as well as the lower part of the tributary valley of the Afon Fathew and an extensive area of flat land along the coast of Cardigan Bay . By contrast with the Mawddach estuary to the north and the Dyfi estuary to the south, the upper part of the Dysynni valley is remote and little visited. It forms a re-entrant, closed by the prospect of Cadair Idris at its north-eastern limit, and dominated by the spectacular feature of Craig yr Aderyn. The main transport axis through the area, the present A493 road, cuts across it, with the result that other than farmers and those who have deliberately chosen to enjoy its natural beauties, it has few visitors. Not only might it have been a haven in Prehistory, but it is possible also that it retained this function in the sixth century when a clas (semi-monastic) church was founded near the shoreline, the nucleus of the present town of Tywyn . Ynysymaengwyn, a settlement which in late Medieval and Modern times emerged as the centre of one of the two most important local estates, would also have been at one time nearer the water's edge. The other principal estate is centred on Peniarth, which lies further inland but it is possible also that in Medieval times navigable water extended this far. These two houses and their associated parks, together with the villages of Bryncrug and Llanegryn and the town of Tywyn emerged as focal points of this area in late Medieval and Modern times. The Corbet family of Ynysymaengwyn in particular, as the major landowners within the study area, were particularly active in draining and enclosing the lands around their property, and acted as patrons of the town of Tywyn . In the nineteenth century their efforts transformed it from a small and wretched settlement into a sub-regional centre with pretensions to becoming a holiday resort, particularly after it was connected to the main railway network in the 1860s. Tywyn has a more important place in railway history as the lower terminus of the Talyllyn Railway, the first railway in the world to be re-opened by volunteer labour. The project area lies within the modern communities of Bryncrug, Tywyn, Llanegryn and Llanfihangel y Pennant, as well as straying into Aberdyfi, Pennal and Llangelynin. In the Medieval period the land north of the Dysynni River lay in the commote of Talybont, the land to the south in the commote of Ystumanner, and included the historic parishes of Tywyn, Llanfihangel y Pennant and Llanegryn. The principal landowners in the late Medieval and the Modern periods were, as noted, the families who held the Ynysymaengwyn and Peniarth estates. Ynysymaegwyn dominated the lower part of the study area, Peniarth the upper. There were however, a number of freeholds such as Dolau Gwyn and Cae'r Berllan. Evidence for pre-Medieval agriculture is limited, though it is clear that the upland areas were already colonised in the Iron Age/Romano-British period. At Craig Ty'n y Cornel a remarkable landscape survives which comprises eleven circular stone-footed huts and a long-hut settlement of three huts associated with yards and paddocks on a south-east facing slope at approximately 330m AOD, together with a wandering field system associated with one or the other, or with both ( SAM : M167, SH6375 0845 C), indicating the possibility of continued occupation into the Medieval or even the post- Medieval period. …much more detailed research needs to be conducted here and across the Dysynni at Llanegryn, be- fore local inter-relationships can be disentangled in either of the southern commotes (Thomas 2001). Though from 1209 until the sixteenth century the Cistercians of Cymer abbey managed lands north of the Dysynni, around Llanegryn and to the east of Talygarreg (Williams 2001), much of this area formed a royal manor, centred around the llys (palace, court) at Talybont, the background to which is discussed more at length in 8.4.1 below. The lay subsidy roll of 1292-3 indicates that Talybont, Ystumanner and Peniarth were already densely populated at that date and refers to ‘Meadow, garden and croft and other easements of the court' at Talybont as well as ‘three vaccaries in which 120 cows can be maintained' in the higher land. ‘Wheat and oats were widely grown even beyond the broad arable lands of the demesne, while equal attention was paid to the care of cattle and the production of butter on the more nutritious hafodydd on the interior higher slopes, and winter fodder was available from the greatly valued meadow clearings in the valley' (Thomas 2001). Even so, it is clear that even some low-lying areas remained wooded until the thirteenth century; it is recorded that seventeen woodmen had to cut a way for the Queen's carriage on her journey from Castell y Bere to Tywyn (Smith, 2001). Although Thomas suggests that in the early medieval period three-fifths of Merioneth was uninhabited and unused, it is clear that assarting of the uplands within the study area begins at an early stage. There is evidence for a quickened pace in the sixteenth century. By this stage, assarting of the upland commons was tending to lead to litigation, and it was in this period that the major landowners initiated intakes of the lowland meadows, from settlements along the lower slopes that had been established in Medieval times. The open field landscape was increasingly being broken up with fences and substantial summer dwellings were being built on uplands colonised, or re-colonised, in the Medieval period (Thomas 2007). The process was slow and incomplete; as late as the 1830s Samuel Lewis was able to describe the parish of Llanegryn as three-fifths unenclosed and uncultivated, and states that much of it was dug for peat (Lewis M4v). Of Llanfihangel y Pennant he remarks ‘nearly one-half of it, situated in the vale, is fertile and in a state of good cultivation, a considerable portion producing excellent corn; whilst the mountainous parts … afford only pasturage for sheep (Lewis 2E4v). The parish's productivity may reflect its comparatively large farms. Nearly half were over 200 acres in extent, and Gwastadfryn, at the head of the Dysynni valley was the largest at 750 acres at the time of the tithe award of 1838 (Thomas 1967, tithe schedule). This seems true of the study area as a whole. The houses of minor land-owners and farm-houses within it take many different forms, reflecting investment at various stages from the sixteenth century to the nineteenth, but are many of them are of considerable size, as are many of the cow-houses and field barns associated with them. Dolau Gwyn (listed II) on the edge of the historic landscape area in the valley of the Afon Fathew, is a largely complete gentry house of 1620, an impressive site surrounded by trees. Cae'r Berllan (listed II), on the Dysynni valley floor at SH 6630 0774 is a striking gentry house incorporating some sixteenth-century fabric, though most of the structure dates from c. 1690. It is surrounded by an imposing garden wall and gate piers, and stands adjacent to substantial out-buildings, including ty ffon (listed II), a possible service building or secondary dwelling. Nant y Caw (listed II) at SH 6537 0937 is an upland farm of the same approximate period with a lofted stable set in line and which with other farm-buildings forms an L-plan. Bryn Erwas at SH 6166 0303 is a nineteenth century farm complex on the former Ynysymaengwyn estate build out of quarry ‘rags' – poor quality slate not suitable for splitting – reflecting its location near both the road and the railway from Abergynolwyn quarry, but is of considerable size and is well-constructed. Active strategies of enclosure were pursued by the landowners, particularly by Ynysymaengwyn, in the early nineteenth century; an enclosure act enabled the estate to enclose 672 acres by the construction of drains and sea-dykes, which limited the extent of the Broadwater. A large area of open water to the south of Tywyn was also enclosed in the nineteenth century, and a drainage system extending from the sea to Craig yr Aderyn was installed in 1862 (Chapman 1992, Whatley 1995). Peniarth was actively exploited by the estate. Peat-digging was clearly an important local activity, though it does not seem to have been exploited commercially but only to have been used to warm the houses of the local poor. There are extensive peat exposures (though little evidence of digging) near Tywyn at SH 5855 9853. In addition, two fish-weirs operated within the area, cored Peniarth and cored Ynysymaengwyn. It is possible that Cymer abbey may also have had a fishery of the Dysynni (Williams 2001). The river was noted for its salmon, and the weirs weirs continued to function until the 1860s when the passage of the Fisheries Act of 1861 and the opposition of the Commission on Salmon Fisheries brought them to an end (Jenkins 1977). All documentation in respect of the larger regional units of Medieval north-west Wales up to the twelfth century refer to cantrefi. These territories are of ancient origin. During the twelfth and thirteenth centuries, however, these cantrefi were subdivided into two or, sometimes, three parts, designated commotes (w. cymmydau). Medieval Meirionnydd was bounded on the north by the Mawddach and on the south by the Dyfi. The Dysynni runs north-east to south-west, entering the sea between Tonfannau and Tywyn. The river, and the watershed of Cadair Idris, divides the cantref. The commote of Talybont lay north of the Dysynni and the commote of Ystumanner to the south. Furthermore, there emerged, within each commote, one township in the hands of the Prince which was run on manorial lines and which served both as a home farm and a focus for the administration and taxation of the commote. This was the maerdref of the commote and at its centre, the llys, might be found royal halls, lodgings, granaries etc. More widely in each commote there would be townships, and hamlets within townships, occupied by freeholders; bond tenants of the prince; tenants who held their land from the bishop and quasi-monastic communities which held their land in the service of a church. Tenure might be complex, particularly in times of stress or depopulation as, for example, during and after the Black Death when more lenient and favourable tenures were devised to attract tenants to the land. In simple terms, during the Age of the Princes and after, there were freeholders whose children had a heritable interest in the patrimonial land; bond tenants under tir gwelyog tenure whose children also had a heritable interest in the land but who were nevertheless saddled with restrictions of movement and profession and who were obliged to make somewhat more onerous customary renders to the king than the freeholders did. Thirdly, there were tied bond tenants labouring under tir cyfrif tenure. By the thirteenth century this tenure was characteristic of estate workers of the king's desmesne and also, but largely invisible in the documentary record, on the estates of dynastic freeholding lords. Tir cyfrif was the most onerous of tenures and while the progeny of these tenants might expect to inherit their fathers' labours, the land was not inheritable and was capable of redistribution. The essential component of community within the commote was the tref, or township, and the important focus of tax collection. As partible inheritance, among free and tir gwelyog bond tenants, was conducive to the proliferation of individual smallholdings, by the twelfth and thirteenth centuries the bounds of a township had become fixed, and, for administrative purposes, subdivisions of the township came into being. These sub-sets, named gwelyau (across much of north-west Wales) were offshoots from the patrimonial core (although still within the boundaries of the parent township) and often bore the names of the sons or grandsons of an earlier patrimonial head of ‘clan chief'. This process was particularly pronounced across the lands of freeholders whose gwelyau were several and their lands extensive. Almost everyone owed tax to the king, or prince, free or bond, and surveys, and the accounts of ministers of the Crown, provide the evidence for the social pattern of the landscape in the central middle ages. As noted, there are three nucleated settlements in the area, the town of Tywyn, and the villages of Bryncrug and Llanegryn. The town of Tywyn is situated on an area of flat land that might have one time have been a sandy foreshore, effectively on a ridge of land which extends to form the bar between Cardigan Bay to the west and the Broadwater and Penllyn to the east, though the shoreline here has seen very considerable changes through the erection of sea-defences and the building of the railway in the 1860s. The nave of St Cadfan's Church, Tywyn. The origin of the settlement appears to lie with the parish church. As Davidson points out, the dedication to Cadfan implies a sixth century date (Davidson 2001), and the name Tywyn (‘sea shore' or ‘sand dune') suggests that it was a coastal location, although possibly the presence of a spring might also have attracted settlement (Lewis 3M3 v). Tywyn is recorded by the Medieval chronicle Brut y Tywysogion as being ‘ravaged by the gentiles' (Vikings) in 963, so it was clearly attractive to raiders, and it is likely that the church was the principal ecclesiastical centre of the south-western part of Gwynedd. Gresham speculates that it would have been well-placed to receive visitors, their servants and horses on the basis of Giraldus' description of his arrival there with Arch- bishop Baldwin in 1188 (Gresham 1987-8). 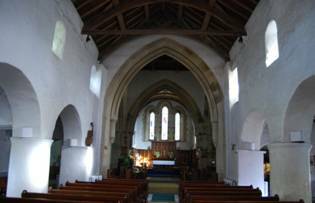 The aisled Romanesque nave of the present church dates from the twelfth century, but the crossing, transepts and chancel are modern, and it is clear that the church saw significant changes in its structure from the seventeenth century to the nineteenth. As noted in 8.3, just south of the later town is the farm of Faenol Uchaf, the name of which may indicate that it was the site of the main ecclesiastical residence. By the thirteenth century, the influence of Tywyn church may have shrunk to the southern commote of Ystumaner, though a villa de Tewyn is recorded in 1283, implying the beginnings of urban life alongside the ecclesiastical settlement. It had nine taxpayers at the time of the Merioneth Lay Subsidy Roll of 1292. Tywyn, however, was not a planned town, and seems to have grown up in an ad-hoc way round the church. The Medieval town was probably adjacent to the church, around what is now Corbett Square, College Green, National Street, Red Lion Street and Church Street (SH 5883 0089 C), the area shown as the urban nucleus on the earliest known map of the town, dating from 1794 (DRO: ZM/3667). Other than the putative ‘borough of Bere', Tywyn is the one settlement within the study area which historically merited a market. Pennant described it as ‘merely lanes bordered by wide and dirty ditches' in 1789. The 1794 map shows a ‘Trefnewydd' (new town) in the region of the present co-op store at SH 5843 0498. Lt Sheringham's Admiralty map of 1835 confirms that the town is growing but is still very clearly a tywyn, being surrounded by largely enclosed areas of foreshore. In 1794 the road which leads away from the Medieval town to the beach is a wandering lane; the present straight High Street is marked on the 1” ordnance survey of 1837 but was not to be built up for some time. The arrival of the coastal railway in the 1860s seems to have been the impetus for building here, as the station was built near where the railway crossed High Street, 500m from the church. Growth seems to have been marked in the 1860s, with the building of houses, shops and hotels and the installation of a gas supply; even so, development along High Street seems to have been sporadic and uncontrolled, with houses and shops of different design and scale, and some plots unoccupied until the twentieth century (DRO: Z/CD/201 [map of estate, 1860], Merioneth 25” o.s., XLVI 9 , Whatley 1995). The slowness to develop High Street may reflect the sale of the Ynysymaengwyn estate to John Corbett in 1878. This did, however, lead to further investment in the town, including the development of the water and sewage system, the building of the promenade, the assembly room of 1893 (now the cinema, built on the site of the Anchor Inn), the Intermediate School of 1894 and the market hall of 1897. Corbett was no relation of the Corbets, and was in fact from quite a humble background; his money came from salt works in Droitwich. Although Ynysymaengwyn was inhabited mainly by his French wife, from whom he separated early on, he continued to shower the town with developments (Boyd 1988). A plan for a pier came to nothing (Wilkinson 1984) but the Promenade was inaugurated in 1889 and it was clearly intended that it should be developed as a seaside suburb of the town. Some moderately sized hotels were eventually built here, as well as the attractive boarding house range ‘Trem Enlli', but photographs from the early twentieth century show these standing in open fields alongside the few vernacular farm buildings which are shown here in the eighteenth century; it was only in the later twentieth that the area came to be entirely taken up with housing, when rows of bungalows and other standard modern dwellings covered the remaining unoccupied spaces. The village of Bryncrug is recorded as a Medieval township and is situated at a point where Cefn Gaer to Pennal Roman road and its successor, the Medieval road past Domen Ddreiniog, cross the Afon Fathew. It is shown on the Tywyn tithe map of 1842 and on an estate map of 1860 as three small settlements, based on Pont Fathew (SH 6089 0333), Perthi Citiau (SH 6089 0311) and Pont y Felindre (SH 6138 0309), which are likely to have expanded with the opening of the Talyllyn Railway in 1866, which would have enabled it to become a dormitory settlement for Bryneglwys quarrymen and their families. It has continued to expand as a suburb of Tywyn in the late twentieth and early twenty-first century. Most of the land at Bryncrug belonged to Ynysymaengwyn but it seems also to have enjoyed the patronage of Peniarth estate on the evidence of the large ‘Peniarth' hotel of 1901, an establishment where the lease was purchased by the Towyn Temperance Society in 1904, who thereafter kept it as a non-alcoholic establishment for the next eighty years. The village seems to have developed in an ad-hoc way with little sense of an estate pattern of architecture being imposed on it. The village of Llanegryn was described by Samuel Lewis as ‘pleasantly situated', on the lower northern slopes of the Dysynni valley (Lewis 1833). Llanegryn church is listed in the 1253 Taxatio, though most of the present fabric probably dates from the fourteenth century, though it lies some little way from the main nucleation of Llanegryn village. Sixteenth century documents refer to the building of a new mill within the parish of Llanegryn and to the destruction of the old mill during the Glyndwr uprising; it is possible that these were situated on the stream within the present village, as a former mill building stands near the bridge. The Llanegryn to the map of 1842 indicates a small ribbon settlement along the road to Peniarth and Pont y Gath at the point where it crosses a tributary of the Dysynni. There are indications of a nucleated village in 1627, and in 1761 a Llanegryn shop sold snuff and tobacco imported from Caernarfon. The local historian David Williams suggests that most of the houses within the core of the village date from 1815 to 1870. He indicates that the distinctive estate cottages built by Peniarth at the eastern extremity of the village (Preswylfa, Bryn Meirion and Maes yr Haf) were built shortly after 1870. There are smaller nucleations such as at Rhyd yr Onnen and at Pandy/Brynglas, which appear to predate the opening of the Talyllyn Railway but to have grown slightly as a consequence of a station being provided to serve them. Both of these are points at which the railway crosses a stream and there appears to have been a fulling mill at both. Non-nucleated settlements within the study area are typically substantial farm-house dwellings. These are often situated at the break of the slope, where the flat lowlands of the Dysynni valley floor suddenly yield to the steep slopes which characterize it examples are Bodilan, Ty'n y Ddol, Tynyfach, Cae'r Berllan (as noted above, a major seventeenth century gentry house, with some earlier work), Llanllwyda and Gesail. Just by Llanegryn are farms such as Glan y Morfa, which may represent sixteenth century assarts onto low-lying meadowland. It was remarked in the nineteenth century that many of the farms in the area were large, and this patterns seems to have remained true into the early twenty-first century. Another, non-farm, settlement at the break of slope is the little group of houses around the church of Llanfihangel y Pennant. Both building types and material illustrate the change from late-Medieval vernacular, through estate sponsored dwellings and farm buildings of the nineteenth century, and railway-era use of brick and other imported materials in boarding houses and villa dwellings, to typical late twentieth-century housing estates. Of these, the use of imported material on any large scale is confined to Tywyn, though there is some use of brick in Llanegryn and Bryncrug, and to a very limited extent in some of the farms. Housing estates are to be found in the nucleated settlements of Tywyn, Llanegryn and Bryncrug. The earliest surviving inhabited houses are typically gentry houses built in the polite tradition, though using mainly local materials. Cae'r Berllan, home of the lawyer Huw Owen in the late 16th century, is a significant building of two floors with attics and cellars, and a front of five window bays. The house was originally built of uncoursed rubble with stepped gables, but the façade was rebuilt in coursed stone c. 1690. Dolau Gwyn, dating from the early 17th century, makes dramatic use of stepped gables, a feature introduced into north Wales by Richard Clough in 1567. It is of three storeys, with a storeyed porch, and mullioned windows. The principal façades are of smooth faced long slabs, though the rear walls are of uncoursed rubble. No houses survive at the former estate of Ynysmaengwyn, though the first, dating from c. 1730, was built of local rubble with long slate quoins, the second house, which faced it, of c. 1733 repeats its outer form but was more regular, whereas the third, and principal, house, a substantial double-pile dwelling was built of neatly cut and finely pointed blocks of slate ashlar with sandstone quoins, strings and voussoirs, with a pedimented doorway. The house at Peniarth, the other principal estate, is part 17th century, and also uses slate ashlar for the early façade, though much of the house was faced in locally made brick in the 18th century. Early houses of lesser status include Old Ty'n y Fach at Llanfihangel y Pennant, a farmhouse of one storey with attics, the original sub-medieval house was of cruck construction with three bays, and walls of local rubble. Raised crucks, relatively common elsewhere in Merionethshire, can be seen in the 17th century barn at Pen y Meini, Llanfihangel y Pennant. Slightly later in date is Gwastadryn, a 17th century farmhouse built in local slate stone of two storeys, with a principal 3 bay range and a rear wing of 2 bays. Cedris, an early 17th century house, is built of irregular slate rubble on boulder foundations, and is of one storey with attics. The main house is of three bays with a rear kitchen wing which might be slightly later. There was some use of mud-walled cottages within the study area; examples survived long enough to be photographed in the village of Llanegryn but the site is now occupied by modern bungalows (y Rhos – SH 6035 0559 – Bro Dysynni Ddoe a Heddiw 1997). A small shed with a mud wall survives at SH 6169 0589. Lewis in the 1830s describes the Tywyn houses as ‘of respectable appearance … built principally of the coarse grey stone which is found in the neighbourhood (Lewis 3M2v) possibly a reference to quarrying at Tonfanau. A dark grey building stone material is still very evident in Tywyn, though in many cases houses which on the basis of their outward proportions appear to be late eighteenth century have often been pebbledashed. There is some, limited, use of slate rags as a building material, both in the Tywyn itself and elsewhere for instance the shop at Bryncrug and the farm Bryn Erwas. This reflects the opening up of Bryneglwys quarry in the 1840s, which for a while exported by horse-and-cart along the Fathew valley but which used the Talyllyn Railway from 1866. However, it is clear that the arrival of the main line railway greatly reduced the price of brick from north-east Wales, and this becomes a major building material in the town there after. Tellingly, Tywyn Wharf station on the Talyllyn Railway is built of brick. However, the proportions of apparently brick-built dwellings, and the distinctive shape of their chimneys sometimes suggest that the use of brick or other imported materials may hide much older elements of the fabric (examples at SH 5879 0089). Some of the late nineteenth and early twentieth century structures in Tywyn make considerable and striking use of brick, such as Paige's Furnishings of 1903, a shop with the prominent display windows on the High Street at SH 5866 0081. So do the substantial terraces of boarding houses erected in the late nineteenth century, with their polychromatic decoration, mingling red brick and yellow brick, for instance Idris Villas (SH 5826 0077). The growing numbers of holiday visitors, mainly from the English west Midlands, led to the construction of a considerable number of these boarding houses in Tywyn. Those on Pier Street are good examples – three-storeys in height, with bow windows and small front gardens defined by low brick walls but making use also of wrought-iron fences. There is also evidence of professionals from outside the area building homes for themselves locally in the nineteenth century and bringing with them a distinctive Victorian style of embellished architecture; Woodlands Holiday Home at SH 61962 0357 was built as ‘Brynffynnon' for a Manchester solicitor, before the 1860s (Boyd 1988). The use of slate as a roofing material is practically universal. The majority of these probably came from the Bryneglwys quarries, which lie outside the historic landscape area. The use of ceramic ridge tiles and other ceramic roof decoration is widespread. The houses estates erected post-war within the study area take several different forms but all reflect UK-wide assumptions about housing provision. They include extensive areas of retirement bungalows at Tywyn as well as two-storey dwellings. As with the Mawddach historic landscape area to the north, this topographically-varied area encompasses coast, river estuary, upland plateau and hill slopes. A concentration of finds of Neolithic stone axes in the Dysynni area is further evidence that it may have been attractive as a Prehistoric communications route, and a notable group of Bronze Age burials and burial urns were identified near Tywyn (Smith 2004). Gresham and Bowen have argued that a linear pattern of standing stones at Waun Fach, Porthygwyddwch and Bryn Seward suggest the alignment of an ancient route from the Broadwater northwards (Bowen and Gresham 1967). Parks and gardens which by reason of their historic layout, features and architectural ornaments considered together make them of great quality. (Parks and a mountain above the boundaries/Fish, corn, meat are below the breast of the hill/The commote is broad with a fitting limit/Every furrow being meadow and woodland). The bard's emphasis is still on the estate as economic resource rather than the demesne as plesaunce, but it is clear that Dafydd Llwyd had made far-reaching changes to his property. Peniarth remains in private hands. Ynysymaengwyn, the other park within the area, has been considerably altered by its present use as a caravan park, and little can now be identified of the former garden. The house has also been demolished. Other gardens and private grounds have also been given over to caravans, including part of Peniarth and ‘Woodlands', where the caravan park is a prominent landscape feature on the southern-facing slopes of Foel Wyllt, overlooking the Afon Fathew. There is comparatively little landscape evidence of productive industrial sites in the area, other than the granite quarry at Tonfanau. Samuel Lewis refers to slate quarries in the parish of Llanegryn which produced for local needs only (Lewis M4v), and there was some small-scale processing of slate slabs possibly sawing, certainly enamelling work, carried on in Tywyn itself. There are mineral trials, both for slate and for lead, around Corlan Fraith in the southern part of the historic character area. As well as the royal mill at Llanegryn, mills are referred to from the late Medieval period. In the sixteenth century a law-suit confirms that a new mill had been built at Llanegryn and that an earlier structure had been destroyed during the Glyndwr rebellion (Thomas 2001). Only one corn mill is recorded on a tributary of the Dysynni (and none on the river itself) though the Afon Fathew and its tributaries drove a woollen mill and two corn mills within the Dysynni historic landscape area. Textile production in the area was small-scale and under-capitalised even by Welsh standards; hand-powered weaving was still being continued at Llanegryn in 1938, the last place in the country where it was reported (Gwyn 2006, 119). The ordnance survey maps indicate light industry at Tywyn at the start of the twentieth century in the form of a slate works and a soda-water factory. In more recent times, small industrial estates have been set out in Bryncrug and in Tywyn. Within the Dysynni historic landscape area the principal military site is Castell y Bere, a foundation of Llywelyn ab Iorwerth and probably the castle which a chronicle describes him as building in 1221. It has been described as quite exceptional that a castle should be built ‘aloft among the hafodydd' (Cathcart King and Kenyon, 2001, 387); Castell y Bere is not a lofty castle but is does fall within a pattern of castle building by Llywelyn ap Iorwerth in the first half of the thirteenth century, and the ground plan is consistent with other native castles of this period. It is possible that the massive curtain walls which enclose an area formerly open and a rock-cut ditch in front of the apsidal tower may reflect work of the year 1287 and the dangers posed by the threat of the rising of Rhys ap Maredudd. The castle may have been destroyed and abandoned in the aftermath of Madoc's rebellion of 1294 (Evans 1967). Other defensive sites from the Medieval period are the two mottes, Domen Ddreiniog and Bryn y Castell. The area's strategic location on the coast facing what was then the Irish Free State, considered to be vulnerable to German invasion, led to the establishment of defensive sites all along Cardigan Bay. RAF Towyn (sic) operated between August 1941 and May 1945, flying Queen Bee and Hawker Henleys for No 1 Anti-aircraft Co-operation Unit and Westland Lysanders for No 6 Anti-aircraft Co-operation Unit but was apt to flood. At the end of the war it was taken over by the army. The runways have disappeared but many of the buildings are extant (Smith 2004). Tonfanau camp extends slightly in the historic landscape area at SH 5621 0351. It remained active until 1965. Traces of military buildings, concrete hardstanding and associated tracks dating from the 1939-1945 war can also be seen in the grounds of Penairth, which were taken over by the Marines. It is understood that both German and Italian prisoners-of-war were kept locally (Annand 1983). Communication systems have left their mark on the historic landscape. As noted above, it is possible that the Broadwater and the Dysynni represent an ancient embarkation area, and that they may be connected with Prehistoric routes in the Mawddach area to the north. Ynysymaengwyn and Tywyn would have been on the tidal reach of the Dysynni until the nineteenth century, and Domen Ddreiniog and Talybont just beyond the tidal limit. Gerald of Wales alludes to his stay in Tywyn on his journey north with Archbishop Baldwin in 1188 but unfortunately says very little about it. It is clear that he arrives overland from the Dyfi estuary, and the likelihood is that he followed the road from here to Talybont and beyond the following morning. The antiquity of the name ‘Talybont' indicates that both that the road has followed broadly the same alignment here since the Medieval period and that a bridge existed here early on. The present stone bridge dates from 1752 but has been bypassed by a modern structure. Railway bridge built in 1911 across the Dysynni. Little thereafter is known, or can be surmised, about the road system until the Industrial/Modern period. Although the Merioneth turnpike act was passed in 1777, there is little evidence that it affected the study area until the mid-nineteenth century, when a turnpike road was constructed which ran from north from Tywyn through Llwyngwril and so on towards Dolgellau (Pritchard 1961). The present bridge which carries the railway over the Dysynni is a structure which carries the date of 1911, a three-span hogged-profile steel girder construction by Fich and Co. of Chepstow, carried on circular steel stanchions. The wooden piles of the earlier bridge are visible in the water. A different type of communications systems is represented by Guglielmo Marconi's wireless receiving station at Tywyn, which opened in 1914 and closed in 1923. Little remains beyond ‘Marconi Bungalows' at SH 5950 0019 (Gwyn 2006). Tourism is evident in the landscape of the Dysynni valley in several ways. The curative properties of the spring at Tywyn were still bringing people to it in the late nineteenth century, by which time it had been formed into a public bath-house (Lewis 3M3 v) – the building which survives at SH 5867 0099 dates from c. 1871 but by 1903 it was out of use and had become part of a soda-water factory (Whatley 1995). The Corbett Arms hotel at Tywyn is an imposing structure, particularly when viewed from the road that leads into the town from the north, and is evidence for a growing leisure market. The earlier six bays of this ten-bay hotel appear to date from the first half of the nineteenth century; another six were added in 1900, the date which appears on the date-stone. Sea-side second homes on the foreshore at Tywyn were already a feature of the late eighteenth century landscape, the property of well-off families from the English midlands who preferred Tywyn to Aberystwyth. However, the attempts to develop a pier and later the Promenade at Tywyn, (1877-1879 and from 1889 onwards respectively), were clearly less than entirely successful (Wilkinson 1984). From the mid-twentieth century onwards, caravan parks have become common; examples are noted at Pall Mall, Ynysymaengwyn and Ysguboriau (all along the A493 road between Tywyn and Bryncrug) at Rhyd yr Onnen and Woodlands, near Pont y Garth and at Llanllwyda. In some cases, chalets have also been constructed. The revival of the Talyllyn Railway has added considerably to the tourist ‘draw' of Tywyn and the area a depiction of the locomotive Dolgoch and its train adorns the ‘Welcome to Tywyn' signs. This he interpreted as + Ceinrwy wife of Gwaddian (lies here) close to Bud and Marchiaw + Cun, wife of Celyn – the grief and loss remain (Williams 2001). Castell y Bere occupies an important place in Welsh nationalist consciousness as the last garrison to surrender to the Anglo-Norman forces, on 25 April 1283. According to Rhyfeddodau y Byd Mawr (Dolgellau, 1828) Peniarth Uchaf was the first place in Wales where tea was brewed, in 1700. At Llanfihangel y Pennant is the home of Mary Jones (1784-1864), whose chance meeting with the Rev. Thomas Charles on the upper slopes of Cadair Idris prompted her to make her pilgrimage to Bala to buy her bible in 1800. Her tearful disappointment when she found out that there were none left not only prompted Charles to give her his own bible but to initiate the process which led to the foundation of the British and Foreign Bible Society. The story of Mary Jones was tailor-made for the Welsh Sunday School of the later nineteenth century, and her cottage was painted by S. Maurice Jones in 1891, as part of a commission from O.M. Edwards for Cymru Coch; it also appeared in Cartrefi Cymry in 1896. She herself lived on into cranky and bad-tempered old age at Bryncrug, where she is buried. The National Library of Wales' Peniarth manuscripts rank as one of the foremost national collections. They were catalogued by J. Gwenogvryn Evans for the Royal Commission on Historic Manuscripts whilst they were still at Peniarth. Dr William Owen Pughe (1759-1853) was born at Ty'n y Bryn, near Pont Ystmanner, though he moved away from the area when he was only three years old. He edited The Cambrian Register and Y Greal, and was principal editor of The Myvyrian Archaeology of Wales. He prepared The Cambrian Biography, and is remembered for his belief that Welsh was near to the primitive mother-tongue of mankind (Dictionary of Welsh Biography). The revival of the Talyllyn Railway from 1951 has also added to the cultural mix and the cultural focus of the region (and initiated a process which in Gwynedd has evolved into a multi-million pound sector and become a vital part of the region's economy). In essence this narrow-gauge railway survived from its opening in 1866 until after the Second World War in practically its original form and with minimal maintenance. Its very decrepitude had already attracted the attention of Picture Post in 1947, when a cow was shooed onto the rails so that it could be photographed holding up a train. Its revival was the work of an engineer from an Anglo-Irish family, Lionel Thomas (‘Tom') Caswell Rolt, who saw it as recreation of a way of life threatened by increased state control, a techno-arcadia which celebrated Victorian entrepreneurship and engineering skills (Rolt 1953). It provided the inspiration for the Ealing comedy The Titfield Thunderbolt, and the lesser-known American film Railway with a Heart of Gold. More recently, Dr Dafydd Roberts has explored some of the cultural tensions between the very English enthusiasm of the Talyllyn Railway Preservation Society and the priorities of the Tywyn community (Roberts 2008). Bowen, E G and Gresham, C A, 1967, The History of Merioneth, Vol. 1, Dolgellau. Boyd, J I C, 1988, The Talyllyn Railway, Oxford. Budenberg, G F (ed. ), 1987, Lewis Morris: Plans in St. George's Channel, 1748 (Stockport). Cathcart King and Kenyon, in Smith, J B and Smith Ll B, History of Merioneth II, MHRS. Davidson, A, 2001, ‘Parish Churches', in Smith, J B and Smith Ll B, History of Merioneth II, MHRS. Evans, E D, 1967, ‘Castell y Bere', JMHRS 3 1 pp 31-44. Gresham, C, 1987-8, ‘Archbishop Baldwin's Journey through Merioneth', JMHRS 10 3 pp 186-203. Gwyn, D, 2006, Gwynedd: Inheriting a Revolution, Chichester. Jenkins, J G, 1977, ‘Rural Industry in Merioneth' JMHRS 8 1, pp 1-15. Lewis, S, 1833, A Topographical Dictionary of Wales. Roberts, D, 2008 ‘”A narrow swathe of English eccentricity” – Ail-agor Rheilffyrdd Tal-y-llyn a Ffestiniog' Cof Cenedl XXIII , pp 163-191. Rolt, L T C, 1953, Railway Adventure, London. Thomas, C, 2001, ‘Rural Society, Settlement, Econimy and Landscape', in Smith, J B and Smith Ll B, History of Merioneth II MHRS. Thomas, C., 2007, ‘Enclosure and the Rural Landscape of Merioneth in the Sixteenth Century', JM- HRS XV 2, pp 129-141. Whatley, A 1995, Tywyn Meirionydd: A Short History (ts notes in Dolgellau Record Office). Wilkinson, J, 1984, ‘Tywyn Pier', JMHRS IX 4, pp. 457-471. Williams, D.H., 2001. The Welsh Cistercians, Gracewing.